Last week, The /star-wars-7-force-awakens-preview-general-hux/Disney Channel and Disney XD released two Star Wars: The Force Awakens behind-the-scenes previews which offered a better look at Domhnall Gleeson as General Hux. Today, we get another behind-the-scenes preview from the Disney networks. This time, the main focus is on Daisy Ridley's Rey. We get to see her plight as a scavenger on the desert planet of Jakku. But coolest of all is, we finally get a look at the alien played by Simon Pegg. We don't get to learn the background of this Alien. And we don't really find out his place in the story. We don't even learn his name. But it appears he is on Jakku with Rey. And he seems to be an alley. This latest Star Wars 7 preview also offers up never-before-seen footage of both Rey and John Boyega's Finn. We get to see them escaping through a hatch. And we get to see a few quick glimpses of Chewbacca and BB-8. 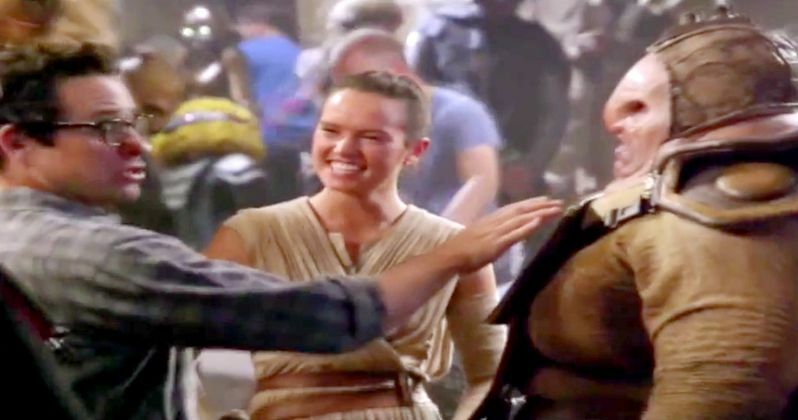 Here's what Daisy Ridley has to say about becoming a part of this amazing universe. "Rey is so wonderful. She's vulnerable. And she's strong. She's a scavenger on the desert planet of Jakku. She's up for new experiences. And new adventures. This has been really special. I love the films. But obviously, now being a part of it, is really amazing. And it has been a lot of fun on set. I think the kids are going to love it, because they can really connect with the characters. BB-8 is amazing. We are packed full of creatures. It's really cool." The Star Wars galaxy is a dangerous place. Epic Battles. Remote worlds. Strange creatures. And deadly threats at each turn. A long time ago a group of heroes banded together to save the galaxy from an Evil Empire. A dark new threat promises to destroy everything they've fought for. Now it's time for a new generation of heroes. Rey, a scavenger searching for answers. And Finn, a rogue Stormtrooper looking for something to fight for. They team up with a mysterious droid named BB-8. These three must make a choice. Continue their journey alone. Or work together to defeat the dark side.